At night we’d have dinner, usually at a Chinese restaurant and then hit the night markets and come home close to midnight. Both The Geisha and The Blog Monster had to put band aids to protect their feet from all the blisters that were forming from all the walking. My arms were so sore from carrying so many bags that someone thought I had broken out in hives (I said it wasn’t hives, it was just the marks the shopping bags had made on my arms!). As usual, the Blog Monster was hilarious as she tried to haggle with the shop keepers at the night markets. “How much for the chinese tea pot?” she asked. “120” the shop keeper replied. I thought, “A bargain!” and was ready to pull out my wallet. “120? Ahhh tooo expensive! I’ll pay you 50 for it!” The Blog Monster said. And back and forth went the Blog Monster and the Shop Keeper for at least 10 minutes. “She’ll never get away with it!” I thought to myself. But somehow, she managed to get me the tea pot for 50 HKD plus a ceramic brush for free! So you can imagine, coming home on Saturday was pretty strange. After more than two months of a constant stream of guests, parties and get togethers, I found myself… alone. While I do love the companionship of my husband, family and friends, I sometimes relish the thought of having my own quiet time. Where there is no need to align my schedule to anyone else’s. There is no need to worry that what I make for dinner will not be to everyone’s liking. No need to share the box of my favourite mint chocolates with anyone else. My husband had gone on a business trip to the US the same time I left and is due back mid this week. So for now, it’s just me and of course the dogs, Baci and Bizou. Times like this reminds me of the period in my life when my husband was studying his MBA in New York. I was in the Philippines living with my parents but they would be away for months at a time visiting my family in Australia. So very often I would find myself preparing dinner for one – myself. One of the dinners I used to often have was a smoked salmon sandwich. On a toasted baguette, with cream cheese, capers, red onions and some rocket – a simple and satisfying meal. Of course dinner for one doesn’t have to be boring. In fact, one of the things I enjoy most is taking the time prepare a beautiful meal. For once there is no one in the background saying “hurry up and stop trying to style our dinner, we’re hungry!” In fact, when I have the time, the ritual of preparing the meal is as enjoyable as eating it! 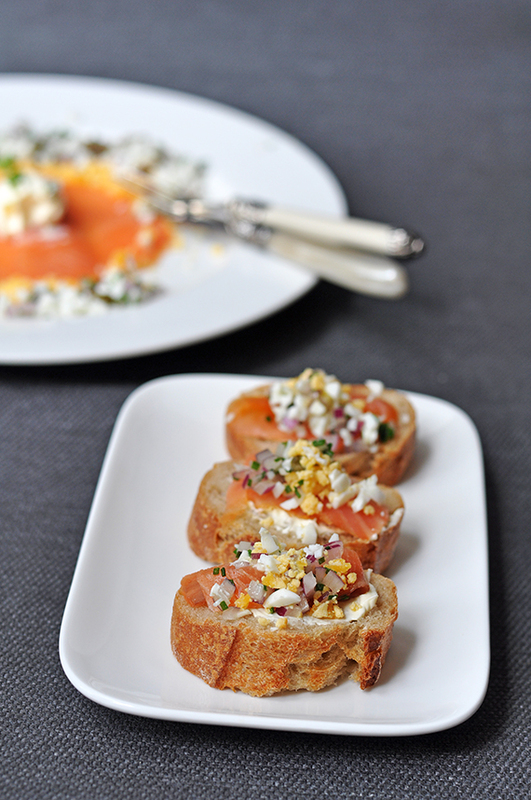 This Smoked Salmon “Tartare” was adapted from Thomas Keller’s Bouchon Cookbook. As you can see, it’s not really a tartare (as I did not chop the salmon finely as a tartare should be done) but it has all the makings otherwise. The recipe below is for one serving (of course!) but since this makes a very pretty starter, feel free to increase quantities if you are making it for guests. Lay the salmon on a large plate. Use a sharp knife to cut the salmon into a circular shape, leaving at least 3 cm between the salmon and the rim of the plate. In a little bowl, mix the shallots and the chives together, add some olive oil and salt and pepper to taste. Now lay the chopped egg yolks around the smoked salmon. Next lay half of the shallot and chive mix after the yolks. Add the egg whites around the shallot and chive mix and then finally another layer of the shallot and chive mix after the egg whites. 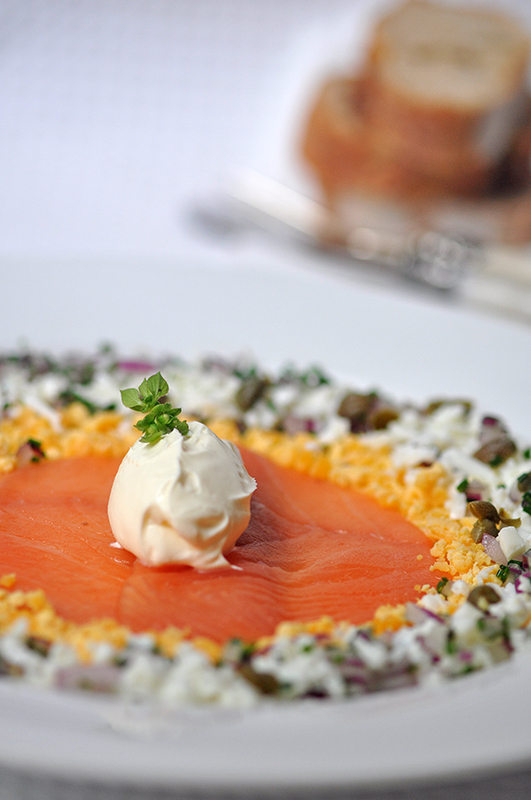 Finally, lay a quenelle of sour cream over the smoked salmon. I too cherish those alone meals. Sometimes its nice to just make something for you =D. That sounds like so much fun! So, glad you were able to do that with them. And, that Salmon Tartare is calling my name. It looks delicious Trissa. I don’t imagine you’d be along for long with that dish. What a nice presention. I guess I can do it also for a crowd with just layering the salmon. Trissa, a lovely meal for one. Looks fabulous! If I have to eat alone, I’ll just have soup….everything in a pot 😛 Wonderful to know you had a lovely trip. That looks almost too pretty to eat, but I bet it tasted even better! I love getting a good bargain but always feel kinda bad especially when I feel that they’ve gotta work so much harder and they’re old and all that stuff. I’m a sucker. lol, my mum loves to bargain things down too. Sometimes I don’t know how she can bust the shop keepers balls so much and sleep at night, but we always walk away paying far less than they wanted us to! That looks gorgeous! Glad you had a wonderful time with your sisters! O it must be weird being on your own after all that time! Well, weird and wonderful I might add… :)) I love making dishes for one too (as long as it is not too often) and I can see why this would be a favorite! A very impressive meal for one. I don’t go anywhere near that effort. Mr Mélanger was shocked at my short cuts when he met me. Probably because he goes to the other extreme and will prepare a meal that takes 2+ hours for just himself! You had me exhausted just reading about what you have been up to. Hope you can take a few moments to breathe now! Good for you! Fussing for yourself. And taking such an enticing photo too. And it sure would be a perfect meal for me. Love smoked salmon. We’ve been following your food blog for a while now and have been inspired to start one of our own! Sometimes being alone once in a while is good. I can cook and eat whatever I want (mom is actually a picky eater). And there’s actually a joy in there. But as Mark (Manggy) says, I could prepare for more than 2 or sometimes even three. The presentation is really gorgeous and absolutely delicious. That looks marvelous. Something that colourful would certainly keep me from feeling too lonely and preparing all those toppings must have kept you from getting bored. you are always so amazing with your food presentation and photography. This makes me go “woah” when i looked at it! Welcome home! Hope you are enjoying some alone time. 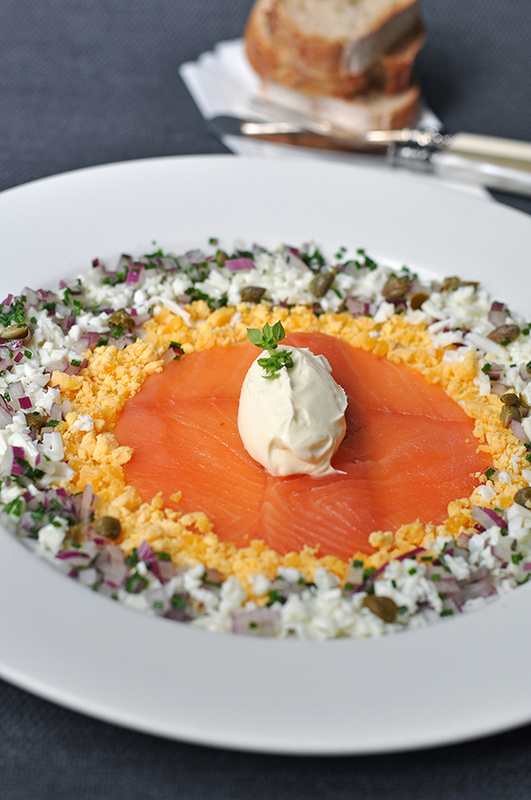 This slamon tartare looks exquisite – yum! And….I am the BM when it comes to haggling…..and I succeed! But then I grew up in Nigeria…where that is a way of life…or you get ripped offfffff! Go BM! Simply, superbly stunning!!!!!!!!!!!!!!!!! OMW – Doffed hat, Doffed hat. Doffed hat! 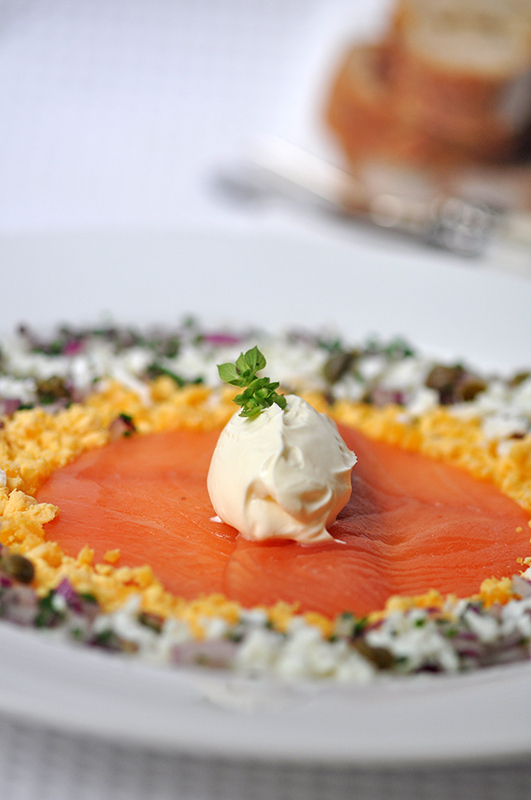 Yummie, with this salmon dish I’d not mind to eat alone…love all the pictures…absolutely gorgeous! Your dinner for one looks gorgeous! Usually when I’m home alone I’m never bothered to make something so pretty. But I love that you have all the time in the world to prepare and you can spend as long as you want photographing your food without people waiting for you to finish so they can dig in! Oh, I should have known this recipe last week when I was home alone! 🙂 I love making a dinner just for myself. I can enjoy all my favourite flavours without thinking if P would like it. Love the presentation. Nice to have you back Trissa. I’m so impressed at your home-alone dinners – I’m the complete opposite, when by myself, dinner is usually something I can eat with one hand while head is stuck in a book (no one to complain it’s impolite to read at the table :P). I think life is wonderful if we enjoy it to the most, either in the companionship of others or alone. Seems you are having the best of both, I could see that from your cooking.. simply beautiful and inspiring! Totally enjoyed your HongKong shopping experience…..
Wow! the presentation is so beautiful. Meal alone can be quite enjoyable especially after a big family reunion. Welcome back! Somedays, the days alone are the best…especially for making and enjoying good food! The salmon looks delicious. Thanks for the post. Oh, it’s a fab dinner. As you said, “dinner for one doesn’t have to be boring”, it’s amazing, enjoying as much as you could. One of the best things about a lovely dinner alone is being able to photograph it without someone asking ‘Can we eat yet??’. Beautiful presentation of your salmon! I love your presentation! It’s always top notch and gorgeous to look at. I do have a confession: The only reason I started following your blog was because of your writing style. The way you write and express yourself is captivating and I can’t help, but want to know more about you. Wow, so pretty, a feast for the eyes AND the belly. Hope you are having a fabulous weekend daaaaaaaaaahling. Dinner for one is the best! I’m quite used to it after all these years….love the whole salmon presentation. Thomas Keller has some of the most amazing recipes. I’m so jealous of your bonding time with your family. That’s one thing I haven’t had in a long time (that’s the sad part about being “uprooted” … sigh!) Your Hongkong trip sounds fun to me… Hongkong used to be my favorite shopping and eating destination. I have not gone back since I moved here in the US. Your tartare looks good. I wish I was there to join you … or did you say you liked the “alone-ness” haha! Your photos are just stunning that I just want ot jump right in and dig in! Trissa, welcome back. I have come to really value my alone time, especially when I travel so much. When I get back, I just want to laze around my apartment doing nothing much…. except of course for tinkering in the kitchen… I just had tuna tatare yesterday at a French restaurant with my girl friends… I would love to reproduce your recipe. A beautiful meal, indeed! 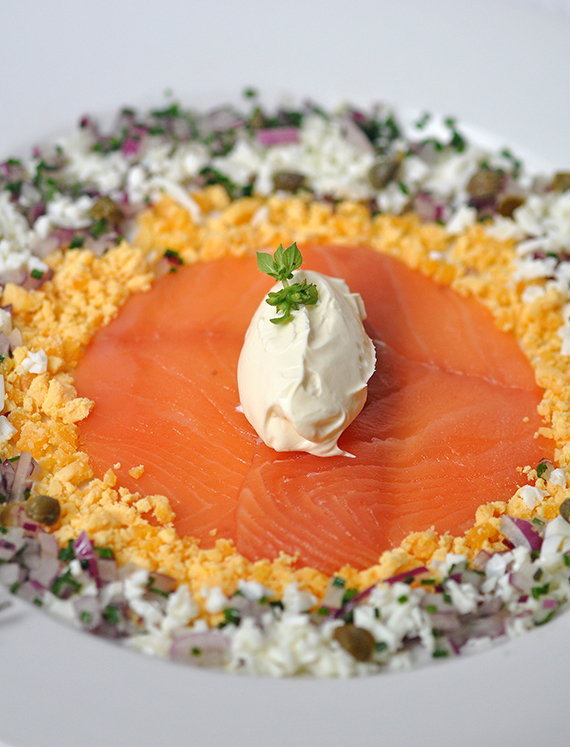 Dinner for one can be nice … “me” time … especially if one is having a gorgeous looking Smoked Salmon Tatare. 😉 Glad to hear that you had a wonderful holiday with your family. Like you, I have no idea how you managed to cough up posts during that time! Man! Too gorgeous to eat alone! where’s my dinner invite? Gorgeous, I love your food styling. Dinner for one in my household is usually instant noodles! Yaaay welcome back Triss!!!!!!!!!! And you know, if dinner for one looked that fantastic, I wouldn’t mind having it all the time (but I would definitely miss the boy if he’s gone for long periods of time). This looks soooooo healthily delicious! I loooove this trissa! I was thinking: “hmmm what do i make MYself today” then I came across this! Perfection. Great photos as always! I am extremely used to preparing dinners for one. This is a great dish Trissa. So simple but really delicious. This will definately be on my list of things to make after a busy day at the office. Ooooh,…Trissa!! This lovely plate of fine food looks stunning!! So well executed!! Looks so good to me,…I so love smoked salmon!! Lucky you!